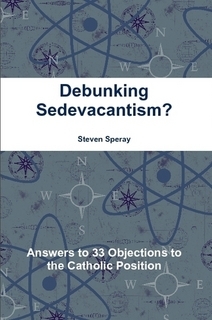 Think you can debunk sedevacantism? Think that sedevacantism is just another Protestant type of sect? Find out that Rome under Vatican 2 is really the Protestant sect invented in the 1960’s. Find out that sedevacantism is really just a Catholic position and not a sect at all. This book answers all the common objections to the Catholic position. Includes: The Vatican I argument of perpetual successors, The Gates of Hell argument, Material vs formal heretic argument, Can’t judge the Holy See argument, Private judgment argument, and many more. In a week, the Church will remember the events that took place in Fatima, Portugal in 1917. The mysterious third secret has remained a secret. Lucia said that the Secret was to be revealed in 1960 because that would be the time that the world would understand it. Since that time, at least two alleged third secrets have been revealed. In 2000, Rome revealed what they said was the real third secret. However, we know it was a lie because no one would have understood it in 1960 since Rome claims the Secret came to pass in 1981 with the shooting of John Paul II. Our Lady showed us the individual who I describe as the ‘holy Father’ in front of a multitude that was cheering him. Then, after some moments we saw the same Pope entering a Church, but this Church was the Church of hell; there is no way to describe the ugliness of that place. It looked like a gray cement fortress with broken angles and windows similar to eyes; it had a break in the roof of the building. 1. Lucia said the secret would be clearer in 1960. Yet, JPII didn’t exist until 18 years later. This is the same reason why the alleged secret revealed by Rome in 2000 doesn’t work. Rome claims the Secret came to pass in 1981 with the shooting of John Paul II. 2. The authority of Rome was not transferred to Fatima as the alleged secret says, “will be” done. It cannot be transferred to Fatima unless a true pope moves there like it happened at Avignon. 3. This secret would not have scared very many Catholics in 1960, or cause them to go to confession as Fr. Malachi said the Third Secret would if they heard it. Not only does Ratzinger have an evil gaze, but also, John XXIII and Paul VI had very evil gazes! The Tradition is Action website makes the “holy father” with an evil gaze to be Ratizinger but notice that the secret was referring to one BEFORE the kingdom of John Paul II. This would not be Ratzinger! I know the real secret didn’t allude to the Church being without a pope as in sedevacantism, but notice that this secret says that “In the kingdom of John Paul II…the dogma of the faith is not conserved in Rome, its authority will be removed and delivered to Fatima” CAN ONLY MEAN THAT JOHN PAUL II DOESN’T CONSERVE THE FAITH EITHER WHICH MEANS HE IS ALSO AN APOSTATE WITH THE REST OF ROME! FR MALACHI WOULD HAVE NOTICED THIS AND NEVER ACCEPTED JOHN PAUL II AS A TRUE POPE!!!!! With this being said, how can the authority of Rome be transferred to Fatima, when only a true pope with the Catholic Faith can make it happen? It took many years for Fr. Malachi to reject John Paul II as a true pope, doing so near the end of his life.